I’ve been working on Radi8 for 3 years now. I’ve started and stopped and started and stopped. I’ve given up... then picked up the pieces and started new. I’ve tossed them out, turned left and picked up different ones. Sometimes I think entrepreneurship is a curse, but more often I think it’s a blessing. The depression that follows a failure is quickly replaced by hope as a new insight emerges. Then I dust off and start climbing again. My hands sweat even now as I think about how I’m going to make it to the next ledge. If you’re trudging, don’t give up. It’s the tortoise that wins the race. What does the world look like if you succeed beyond your wildest dreams? This is a question I asked myself recently as I was working on the business plan for another startup. I didn’t like the answer. Let’s start at the beginning. I had discovered a way to amplify marketing content using new technology. It would be faster, cheaper and spread content all over the world with just a few clicks. Businesses would be able to reach customers in every corner of the internet and spread their marketing messages 100x further than organic sharing. Enterprises would ditch email marketing and spend their marketing budget on my new company. This sounded great from a money-making-machine point of view. But then I asked myself what would the world look like if I succeeded beyond my wildest dreams? What if every single company used my service to amplify their content 100x? Would I even want to live in that world? Yuck. There are two types of entrepreneurs I’ve encountered. Those who are enamored by technology today, but care little about the future it creates—and those who care about the future they create, and work to invent it today. It’s easy to fall into the trap of pushing the boundaries of technology and letting the chips fall where they may. It’s easy to look at all the money flowing into your checking account and hide your head when you look outside and see kids shooting each other. What’s difficult is walking away from it all, taking the time to imagine the future you want to live it, and inventing it. I’m getting my eyes off the screen and letting my imagination soar. I can imagine a world where we care about kids—we inspire them, listen to them, give them the time they need to overcome whatever obstacles they face. I imagine a world where we are passionate about each other and countries build bridges not walls. I imagine a world where we work hard and are pleased by the craftsmanship of our skills, whatever they may be. I imagine a world where people remember our names and faces because we matter. I can’t work on another business idea without knowing I’m inventing a future I want to live in. When I started my first company, FastPencil, in 2007, there weren't a lot of tools to get up and running quickly. But I knew it would be critical to leverage technology if I wanted to stay lean and get to first customer fast! So we immediately setup Google Apps for email and document collaboration. We also used Skype and a few other online services. Every company needs a CRM and most go straight to Salesforce, but I met John Ferrara from Nimble at a Social Selling conference and I'm blown away at what he has been able to do with social CRM. Some of you may remember John from the company Goldmine. Goldmine was one of the first popular CRM applications available. It helped you stay organized and connected to your contacts. 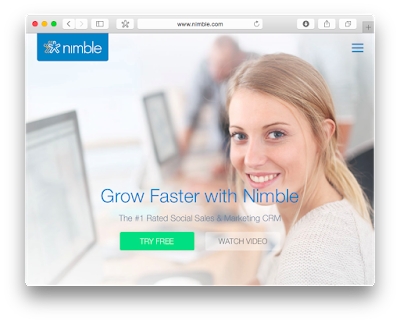 Nimble does all this and more... for today's social selling environment. I started using Nimble as I built out my new company, Radi8. It has been incredible. Not only does it help me stay organized and in contact with my prospects and leads, but Nimble gives me insight everywhere I go online. I highly suggest you give it a shot if you're just ramping up your startup. If you don't already have it setup, take my advice and get Google apps for your business. It's easy to setup, you get email, file sharing, document editing and collaboration. It's fast and powerful. Don't even bother with Microsoft, this is the way to go for your startup. Customer support is critical and Zen Desk does it better than anyone right now. You can setup a simple account and plug it into your web site for instant customer support. As you grow you can add features and users to handle the increased load. You probably already have a stack and your developers are taking care of that for you, but if you don't, take a look at Heroku. You can quickly setup and start building out your apps with Heroku, then expand and add services as necessary. Whether you like Ruby, Node or just plain old HTML, Heroku makes it easy... and fast. And that's the name of the game right now. Twitter, LinkedIn, Facebook Pages, etc. Of course you should grab all the important social properties you can. Whether it's Instagram, Snapchat or just Facebook for your business, you can't go without social. One of the things we discovered while building Radi8 is that social drives organic traffic to your content better than any other program. But marketing managers seem to get overwhelmed with managing social. If you want to make an impact, invest in social for your business... social selling, social demand-gen, social network management, social analytics, social CRM. It's worth it. I'm sure there are a few basics I'm missing, maybe I'll write about them in another post. But this should get your started. Remember, your goal right now in your startup is to find customers and validate your problems and solutions. Don't waste time setting up and managing user license for Microsoft, or screwing around with all the options in Salesforce. Get up and running fast, then worry about this stuff later. Connect with me on Twitter (@MichaelPAshley) and follow along as we pivot Radi8 (@Radi8HQ) from a social selling app to a social demand-gen platform that will drive traffic to your content and give you insights into your social marketing programs. One of the hardest things to do as a founder of a startup is to admit when your idea isn't working... your idea about the business, your idea about the product, your idea about the problem! That's exactly where I found myself a few weeks ago. It was time to admit Radi8 was chasing a problem that wasn't very painful. But it's not always the fastest who wins the race... sometimes it's the one who turns around first when they realize they are heading in the wrong direction. That being said, one of the most exciting things about reaching this phase in your startup is the freedom and excitement of changing direction. After a year of trudging along in one direction you gain a lot of very valuable experience and insight. Some of the most valuable things you develop are relationships with your potential customers. And if you've been paying attention, you should have learned what some of the real, and painful, problems they face look like. With that information in hand, I made the tough decision to get back to the whiteboard and try a new direction—the pivot. This time I vowed to spend more effort up front working directly with the potential customers I had already built relationships with. And I also made the decision to use a new tool called UXPin for my mockups, testing and collaboration. 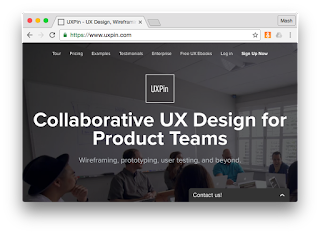 I've never used UXPin before but I have used other UI/UX tools like InVision and Balsamiq. Being able to mockup, share and test ideas quickly is critical at this stage. The reason I chose UXPin is their built-in design and collaboration features. I should be able to quickly mockup my ideas and flows using their designer and libraries—without ever opening Photoshop! Once I get the experience sorted out and tested, I can invite my designers in to produce the actual UI and then send everything off to engineering fully spec'd. So this is the first of many posts I plan to do as I pivot Radi8 from a social selling app to something more like a social demand-gem platform. Follow along if you're interested and let me know if you would like to be part of the beta group to test out the new Radi8 app when it's ready. Lately there has been a lot of discussion about standing for the flag and the national anthem. Some feel it's disrespectful to sit in protest, some feel sitting in protest is the ultimate symbol of freedom. To me it's a statement of commitment. It's pretty easy to look back on a long, fulfilling life and see what you were committed to. Maybe you're reflecting on your life, and you realize how strongly you were committed to helping the poor, or how fiercely committed you were to your family. Maybe you were committed to making as much money as you could. Maybe you were committed to donating all of that money to non-profit organizations before you die. Regardless of your commitment, it's much easier to see what was important to you in retrospect. But what do you do when you're a young kid, just out of high school or college? Is it really important to be committed to anything right now? It's hard enough making a commitment to meet for a movie, or to study together. Why can't I just go with the flow? Why not just stand for the flag, and sing the national anthem, because everyone else is doing it? I believe it's more important than ever to help young kids find and make commitments that matter—commitments that will last a lifetime. In a world growing more and more fragmented, we need to have certain things to hold onto... things that don't waver, things you don't compromise. Standing up for something you believe in takes courage. Sitting down for something you believe in, when the rest of the world is standing, takes even more courage. But when you make a commitment, when you discover deep inside the light that burns for you, it's no longer possible to go with the flow. Doing what you say you're going to do takes integrity. Commitment is a special kind of promise you make to yourself. Nobody else really knows what you stand for until you stand. If you decide in the heat of the moment that you're too scared to keep your commitment, the only person who really knows is you. That's why it takes integrity to keep your commitments. The more commitments you make, and keep, the stronger your integrity. You might feel like commitments are chains that hold you back from doing whatever you want. But it's exactly the opposite. Commitments give you wings so you can fly with confidence through this fragmented and conflicting world. When you hold tight to your commitments you don't waver, you are not easily swayed, not easily tempted. Freedom is not the ability to do whatever it is you want, whenever you want—freedom is doing what you say you're going to do. Exercise that freedom by staying true to what you're committed to, even when every force is raging against you. But they do reflect your beliefs. Commitments are real, tangible expressions of your values and beliefs. When you make a commitment to feed the poor, then you feed the poor. When you make a commitment to marriage, you stay married. When you make a commitment to your family, you do whatever it takes to support your family. Commitment is tangible. Commitment isn't easy—it's hard. It might seem easy at first, but when things get difficult you'll really get tested. No matter what you are committed to, whether it's a marriage, a belief, or a cause, stick with it—don't give up, don't waver. You'll either discover deeper meaning in your commitment, or you'll discover that you're not really committed. Then, take a long look into the future... what do you want to say you were committed to when you reflect on your amazing life. It's easy to share about brands you love. The question is why aren't you sharing about your own company? I have never heard someone say it's because they hate their company. "I'm afraid to share something wrong or something that will make me look stupid." "I want to share, but I don't have any content." Both of these issues are very real and a major hurdle for B2B sales reps today. I think Radi8 has come up with a really cool solution for both of these issues. If you're interested in being part of our next Radi8 Cohort, let me know. We will be kicking off our next pilot program at the end of April. If you want to disrupt something meaningful, disrupt the damned enterprise sales cycle! Seriously, I have been living through the hell of enterprise sales for the last 5 years and there's one thing I just don't understand. Why does it take a year to get enterprise software approved and deployed? Maybe a year didn't really mean anything to an enterprise 30 years ago, but today a startup can put you out of business in a year... an economy can collapse in a year... a nation can dissolve into chaos in a year! We don't have time to wait around for you to get all your signatures. We don't have time for you to get your budgets in order. We don't have time to get IT approval. The world is moving too fast. Someone needs to make it faster and easier to get game-changing software into the enterprise. Is that someone going to be me? I sure am going to try and I hope you'll help me. 1. Scale down the size of the solutions - One of the largest hurdles to enterprise sales is getting all the stakeholders together. If you can remove the number of stakeholders you can simplify the buying process. I was at a conference today and one of the presenters was talking about how important it is to get Marketing, Sales, HR, the exec team and the sales enablement team all involved in the purchase and rollout of their software. Are you kidding me? If your solution requires that much alignment, maybe you're trying to solve too many problems. 2. Solve tiny problems - Rather than solving all the mission-critical problems in an organization in one software package, try solving tiny problems that add up to a significant impact. Why is this important? Because you reduce the fear of failure and lower the risk of deploying your product. 3. Incremental Impact - In the movie, "The Martian" there's a cool line. He says, "Solve one problem, then solve the next." I like this because it should be true for enterprise software, too. If you scale down the size of your solution, solve tiny problems and produce incremental impact, you can solve one problem at a time, for one stakeholder at a time, and add up to massive impact on the organization. 4. Impact the end users - Most enterprise software solves problems for the wrong people. You buy a content management system to secure your enterprise content, not to help end users do their job faster. You buy Salesforce so management can track pipeline, not so your reps can sell more. The list goes on. Instead, try making software so the end users can be more productive... and of course make it secure, and allow management reporting, but that's secondary. Get software into the hands of the end users who will use it immediately. This is my plan. If we can create software that solves tiny problems and produces incremental impact for the end users, and if we can make it easy to use and easy to buy, I think we can destroy the enterprise sales cycle completely.